Students at Nyamachaki Primary School, Nyeri County, Kenya. April 23 was first proclaimed as World Book and Copyright Day by UNESCO in 1995 to pay a worldwide tribute to books and authors encouraging everyone, and in particular young people, to discover the pleasure of reading. This day was chosen because on this date in 1616 Cervantes, Shakespeare and Inca Garcilaso de la Vega all died. Moreover, it is also the date of birth or death of other prominent authors from all over the world. Each year on April 23, UNESCO and the international organizations representing the three major sectors of the book industry –publishers, booksellers and libraries–select the World Book Capital for a one-year period. This year Athens was chosen for the quality of its activities, supported by the entire book industry. The aim is to make books accessible to the city’s entire population, including migrants and refugees. 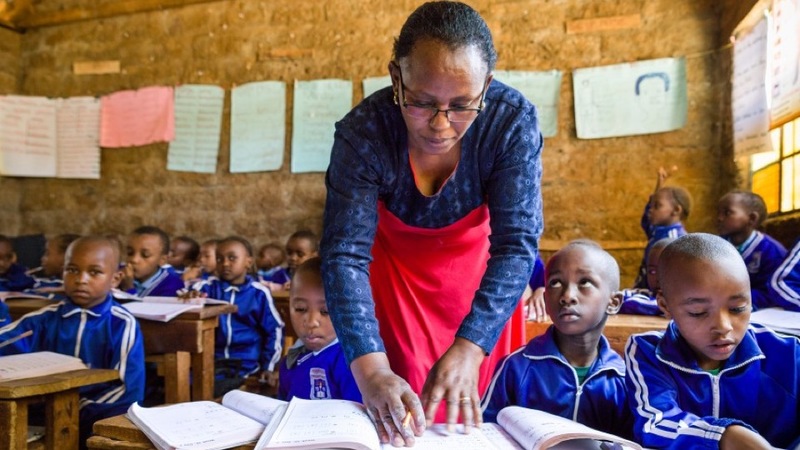 Statistics in sub-Saharan Africa tell a revealing story: more than 1 in 3 adults cannot read; 182 million adults are unable to read and write; 48 million youths (ages 15-24) are illiterate; 22% of primary aged children are not in school (30 million children). Life expectancy is 58 years; 44% of people live below the international poverty line of $1.25/day. In 1990 the adult illiteracy rate in all of Africa was 53%, and in 2015 it was estimated to be 63%. Similarly, in 1990 there were 133 million illiterate adults in sub-Saharan Africa, but by 2011 there were 182 million. These statistics are depressing and should call for immediate action by African leaders to invest more in their education systems and create a conducive environment for the book to thrive. Not so any more, as ADEA and its Working Group on Books and Learning Materials (WGBLM) have partnered with the Global Book Alliance (GBA) and the United States Agency for International Development (USAID) to tackle the book hunger in Africa. A recent joint workshop in Abidjan, Ivory Coast, brought together 22 African countries in an effort to revamp the book industry and publish books in African (national) languages across Africa. The book industry all over the world constitutes a chain including writers, publishers, printers, booksellers, librarians and readers; with the government being an overall referee especially as regards tax regimes and relevant policies. Each of these serve a distinct role and it is critical that each member is allowed to perform their role otherwise there is a likelihood of a backlash and malfunctioning of the chain. Among the stakeholders, the librarians and booksellers are meant to work closely together, because their relationship is that of a buyer/consumer one. Booksellers have the responsibility to bring under one roof all the publishers titles for ease of reference and accessibility of the consumer, but still this is not the case in the vast majority of African countries, which seriously reduce the availability of books to the consumers. The Public Library Manifesto adopted in 1994 by UNESCO and the International Federation of Library Associations and Institutions (IFLA) describes a public library as a living force for education, culture and information and as an essential agent for the fostering of peace and spiritual welfare through the minds of men and women. It also defines a public library as a local center for information, making all kinds of information readily available to its users. However, this can only happen if libraries are enabled to be the cornerstone of democracy in our communities because they assist the public in locating a diversity of resources and in developing the information literacy skills necessary to become responsible, informed citizens and to participate in the democratic process. This is why the ADEA WGBLM, while working on the formulation of national book policies, is also sensitizing governments and other stakeholders on the necessity of having appropriate national reading policies to complement the national book policies. These primarily aim to build a strong literate environment everywhere in the communities and ensure possibilities for books availability and affordability to readers wherever they live. It has been said that a popular government without the means of accessing information is unlikely to deliver development for its citizens. This is because libraries serve as the source for the pursuit of independent thought, critical attitudes, in-depth analysis of events and provide a variety of information as it becomes available. In so doing, they guard against the tyranny of ignorance. Among other things, libraries ensure freedom of speech, the freedom to read, and the freedom to hold different views. As truly democratic institutions, libraries are for everyone and are to be established everywhere as they provide safe spaces for public dialogue and engagement. They also provide free resources needed for the public to inform itself in order to participate in every aspect of governance. Above all, they provide access to government information so that the public can monitor the work of its elected officials and benefit from the data collected and disseminated by policymakers. In addition, libraries serve to prepare citizens for a lifetime of civic participation and in turn they encourage the development of civil society. It has been stated that citizenship is about making informed choices and decisions, about taking action, individually and as part of collective processes. Each individual needs to play a full part as an active citizen and be fully engaged through the exercise of moral responsibility, of his or her rights and responsibilities, and through community involvement. The journey that ADEA has begun in collaborating with USAID through its flagship project, the Global Book Alliance (GBA), seeks to work with members of the book chain and governments to strengthen the creation, production, distribution, dissemination and use of information especially among children. This very welcome move should see ADEA’s Working Group on Books and Learning Materials contributing positively towards promoting knowledge societies and nurturing literacy across Africa.